Over-treated, damaged or naturally dry hair can benefit from a good deep conditioning treatment. However, deep conditioning treatments can be expensive, depending on the brand you want. Instead of spending money on a deep conditioning treatment, use the items in your pantry by creating your own deep conditioning treatment with mayonnaise and olive oil. The nutrients in these products help nourish and revitalize dry, damaged hair just like the conditioning treatments you buy at the store. Put 1/4 of a cup of mayonnaise in a clean, dry bowl. It does not matter if the mayonnaise is warm or cold. Add 1 teaspoon of extra virgin olive oil to the bowl. Stir the mayonnaise and olive oil together until well-blended. Wet and wash your hair thoroughly. Gently pat your hair dry to remove any excess water. 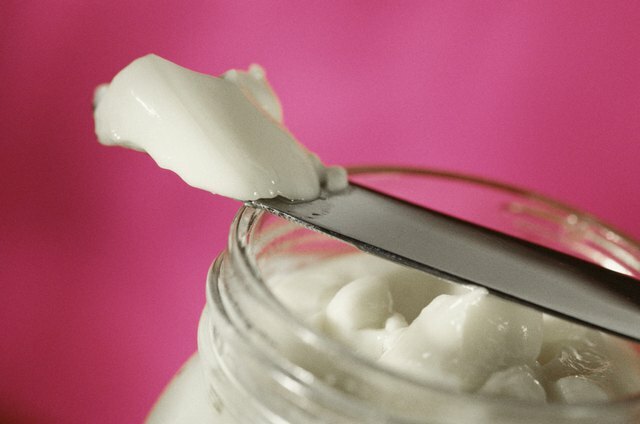 Scoop the mayonnaise and olive oil mixture onto your fingertips and gently massage into your scalp. Run a wide-toothed comb through your hair to evenly distribute the mixture. Add more mixture to your fingertips and massage into the rest of your hair. Loosely pile your hair on your head. Place a shower or bathing cap over your hair. Place a large, dry towel in the dryer for two minutes. This heats the towel without making it hot. Wrap the towel around your head. The heat from the towel will gently warm your hair and helps it absorb the mixture. Leave the mixture on for 30 minutes. After 30 minutes, rinse out the mixture with warm water. Do not use shampoo when you rinse. 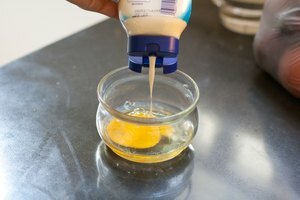 Make your own mayonnaise by combining one egg and 1/2 cup of olive oil. Mix thoroughly until it reaches a thick consistency. You can add more olive oil to the mixture once it thickens. 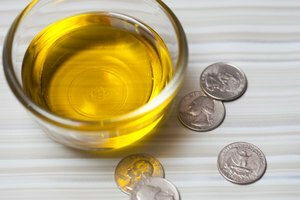 You can also use olive oil as a hot oil treatment, as well. Warm 3 tablespoons of olive oil in the microwave. Spread the oil through your dry hair. Put on a shower cap and let it sit for 30 minutes. Rinse your hair thoroughly to remove all of the oil. Deep-condition your hair only once a week. Too much conditioning will leave your hair limp and over-saturated.